Fall Leaf SuperLEAF 24oz. ECO-Paks! Ideal Leaf-Litter!! A multi-dimensional brown leaf flake which provides highlights to shadows, tree branches, shrubbery, vines and leaves. 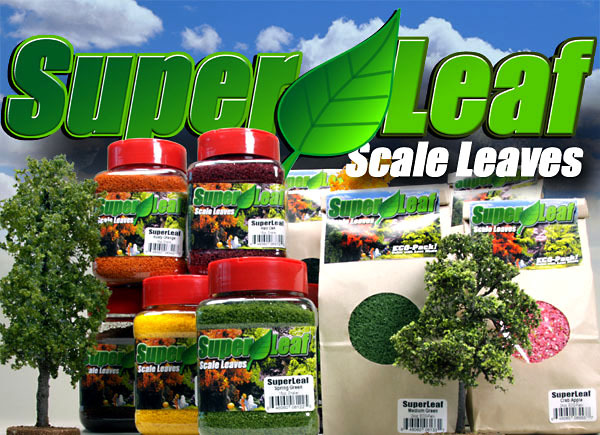 Fall Leaf Tone SuperLEAF 1-Gallon SuperPak! For those layouts in need of lots of premier leafy trees - available in 1-gallon super-size bag! Plum Purple SuperLEAF 16oz. Shaker! Ideal for not only the purple plum tree but ideal for any deciduous tree or plant in need of a deep reddish-purple leaf! Plum Purple SuperLEAF 24 oz. ECO-Paks! Ideal for not only the purple plum tree but ideal for any deciduous tree or plant in need of a deep reddish-purple leaf! Plum Purple Tone SuperLEAF 1-Gallon SuperPak! For those layouts in need of lots of premier leafy trees - available in 1-gallon super-size bag! Red Oak SuperLEAF 16oz. Shaker! A new red oak autumn for the 'peak season" look of fall! Red Oak SuperLEAF 24oz. ECO-Paks! Red Oak and ALL ECO-Paks. A new red oak autumn leaf for the 'peak season' look of fall! Red OakTone SuperLEAF 1-Gallon SuperPak! For those layouts in need of lots of premier leafy trees - available in 1-gallon super-size bag! Driftwood Tan SuperLEAF 16oz. Shaker! Ideal Leaf-Litter!! Available in a handy 16oz. refillable jar (by volume) sealed with a convenient Shaker-Spoon Cap. Approximately 2 cups of leaves (by volume). Driftwood Tan tone SuperLEAF ECO-Paks! If you're tired of all the plastic jars and are "ECOnomically FRIENDLY", our NEW 24oz. (by volume) bag of SuperLEAFS are the ticket! Approximately 3 cups of leaves. Thats 8oz. MORE than the Shaker Bottles for the same price! Driftwood Tan Tone SuperLEAF 1-Gallon SuperPak! For those layouts in need of lots of premier leafy trees - available in 1-gallon super-size bag! Sandstone SuperLEAF Shaker! Available in a handy 16oz. refillable jar sealed with a convenient Shaker-Spoon Cap. Approximately 2 cups of leaves (by volume). Sandstone SuperLEAF ECO-Pak! Use for flocking trees, bushes or forest debris. Approximately 3 cups of leaves. Thats 8oz. MORE than the Shaker Bottles for the same price! Sandstone SuperLEAF 1-Gallon SuperPak! For those layouts in need of lots of premier leafy trees - available in 1-gallon super-size bag! Rawhide SuperLEAF - 16oz. 'Shaker'. Our new rawhide tone, multi-dimensional leaf flake that has a stippled surface which gives volume to foliages and provides natural highlights and shadows on tree branches and bushes. Rawhide SuperLEAF - 24oz. Economical ECO-Pak! Our new rawhide tone, multi-dimensional leaf flake that has a stippled surface which gives volume to foliages and provides natural highlights and shadows on tree branches and bushes. Rawhide SuperLEAF - 1 Gallon SuperPak! Our new rawhide tone, multi-dimensional leaf flake that has a stippled surface which gives volume to foliages and provides natural highlights and shadows on tree branches and bushes. WHITE BLOSSOM SUPERLEAF 16oz. Shaker- Excellent where white petals are needed! Use to highlight fields, bushes and flowers...daisies, baby's breathes, lilys, asters, and anenomes only to name a few! White Blossom SuperLEAF 24oz. ECO-Pak! - Excellent where white petals are needed! Use to highlight fields, bushes and flowers...daisies, baby's breathes, lilys, asters, and anenomes only to name a few! White Blossom SuperLEAF 1 Gallon SuperPak- Excellent where white petals are needed! Use to highlight fields, bushes and flowers...daisies, baby's breathes, lilys, asters, and anenomes only to name a few!